Jurong in District 22 is largely occupied by industrial properties and woodlands, yet the emergent region is getting an upgrade with all the residential, business and commercial developments lined up. Jurong now boasts of being an up-and-coming leisure destination in the west of Singapore. In the heart of Jurong lies Lake Life, a 129,135-square foot executive condominium by Evia Real Estate (a joint endeavor of CNH Investment, OKP Land, and BBR Development). This development is a 99-year leasehold in Jurong Lake District, on the corner of Yuan Ching Road and Tao Ching Road. While ECs abound throughout the island of Singapore, there aren’t many in such a prime, picturesque location. In fact, there hasn’t been a new EC development in the western areas for a long while – Lake Life will be the first in 17 years. Jurong Lake District is booming into a prosperous leisure and business hub, with tons of upcoming recreational options, job opportunities and various attractions. It is made up of two parts, namely Jurong Gateway and Lakeside. Jurong Gateway is the key commercial area in the west, currently being enriched to be the largest regional centre outside of the CBD. Lakeside, meanwhile, is a waterfront community likewise being populated with new business addresses and lifestyle hotspots. 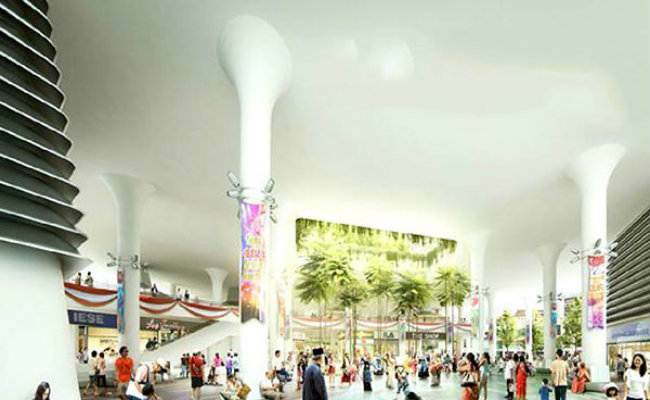 Jurong is already known as a growing shopping mecca. It has a roster of superlative malls, including Taman Jurong Shopping Centre, Jurong Point, Westgate, Jem, JCube, IMM, and Boon Lay Shopping Centre. It’s also known for its green environment, punctuated by sprawling gardens and public parks. The neighborhood overlooks the Lake District, which is arrayed with parks, gardens, water features, and various attractions. In it are Jurong Lake Park, the Japanese Garden, and the Chinese Garden. Nearby are Jurong Country Club, Science Centre Singapore, and Snow City. From the Lake Park, follow Jurong River westward to Jurong Central Park. Or head north to get to Palm View Garden or Bukit Batok Batok hillside Park. Or go across the AYE to the largest bird sanctuary in Asia, Jurong Bird Park. The surrounding area is also a food-lover’s paradise, with all the wonderful places to eat at. For your day-to-day meals, you can shop at any of the nearby food markets: Taman Jurong Market, Jurong Port Road Food Center, Yuhua Market and Hawker Center, Boon Lay Place Market, or Quality Road Food Centre. For something a bit more special, you can try the various restaurants all around. Lake Life is designed to contain five 20-storey blocks, interspersed with wellness facilities for the use of its residents. All these come up to a total of 546 units. Getting around from Lake Life is pleasantly easy, whether by public commute or by private vehicle. First of all, Yuan Ching Road has several bus stations within a few steps from your new home. Secondly, the Lakeside MRT Station is within a leisurely stroll, and it lets you on the East-West Line. A shuttle service to the station is provided via Smart vehicles. Whenever you feel like taking your own car, you can take the Pan-Island Expressway or the Ayer Rajah Expressway. Just to let you know how accessible the site is: you can get to the Central Business District in fifteen short minutes. Naturally, Lake Life also comes with comforts and conveniences to make living even more delightful. These are divided into 3 categories, respectively named Home, Harmony, and Health. Classified under HOME are amenities created to forge bonds with your loved ones. Create lasting memories at the Family Barbecue Deck or the Picnic Green. Enjoy a special meal together in the Sky Dining Area and the Show Kitchen at the 20th floor of Block 2. Take your kids to the Adventure Hobbit Hill, the Toddler Play Park, Toddler Play Pool, or the Children’s Garden Patch. In the HARMONY section, you’ll encounter a wealth of offerings that can help you relax as you commune with nature. It features several different gardens with various purposes. Delight in the multicolored blooms in the Fragrance Garden, the Colours Garden, or the Touch Garden. Then center yourself in the Zen Garden or Yoga Park. Discover the joys of urban farming in your free time, at the Greens Garden, Herbs Garden, or Roots Garden. The Harmony zone also features a Garden Chess Set and a Hammock Forest. Lastly, HEALTH promotes exactly what it’s named for. This is where you can make time for your fitness and well-being. There’s a swimming pool, as well as a Water Aerobics Pool. For health buffs, there are facilities like the Outdoor Fitness Station, True Sky Gym and a Taiji Green. There is also a Dance Hall and a Yoga Studio. If you prefer to sweat it out through sports, you can use the Futsal Pitch, the Basketball Half Court, or the Tennis Court. For the seniors, there is a Water Therapy Zone and a Wellness Area. After an invigorating workout, you can wind down at the Steam Room or the Foot Therapy Garden. The development even has free internet in all the common areas. Add to this the following bonuses: family parking lots, a guard house, a pedestrian gate, a charging station for electric cars, and a sheltered bike yard. But beyond simply providing life spaces and leisure, Lake Life also promotes community. Hand-in-hand with the lifestyle it endorses, there is an array of activities for the benefit of the residents. Take advantage of the dance classes, swimming lessons, tennis lessons for kids, cooking classes, pet sports and others. A fulfilling life awaits you at Lake Life Executive Condominium. It truly lifts the standard of EC living and promotes a better sense of community. Start planning to improve your life now – who knows, you might just be qualified for a S$30,000 grant. Be sure you meet all the requirements for buying an EC. Got questions or concerns about how to buy an EC, or how to compare mortgage loan Singapore? Avail of the services of iCompareLoan mortgage broker. In District 25’s lush, green, Woodlands setting emerges the first executive condominium complex initiated in 2014: Bellewoods EC. Situated at the junction of Woodlands Avenues 5 and 6, Bellewoods is a 99-year leasehold developed by Qingjian Realty. The 226,000-sq ft plot of land will be populated with three 11-storey and nine 12-storey blocks and a variety of lifestyle offerings. With such a selection, this EC caters to families of various sizes. What’s more, most units at Bellewoods will be applying a brilliant home solution called CoSpace. CoSpace allows home buyers to choose a layout that will work for their family’s specific needs. For instance, if your family is the type that loves to hang out at home together, you can opt for a layout with a wider living room, so you can all be comfortable for those bonding moments and movie marathons. If you don’t care much for a spacious living area, you may want to turn the extra space into a study room, a personal library, or a guest room. Perhaps you’re a foodie family, and you would all appreciate a large walk-in pantry. Or maybe you need a large storage space for tools, sports equipment, hobbies, and other stuff. If you need it, why not create it? Bellewoods EC is not just about residential spaces; it’s about living well. It comes with special conveniences for you and your family to delight in. On a hot day, you can take a cool swim in the lagoon-like free-form pool, or maybe do a few rounds in the lap pool. Meanwhile, your kids can have some fun in the splash pool or the wading pool. Then you can soak up the sun on the deck. There’s also a family pool where you can all take a plunge together. Sometimes a swimming pool just won’t do; there are days when you’d like to go for a refreshing dip while getting some relaxing bodywork. Good thing Bellewoods will also have a hot tub and a hydro spa. Everybody loves a good spa experience, and you can have one without going far from home. After all the rest and relaxation, don’t forget your physical health. Improve your stamina at the fitness alcove, or increase your resistance by spending a few minutes in the indoor gym each day. If you’d like to have a workout while having fun, you can hit the tennis court with your buddies. Be sure to encourage your kids to be active outdoors as well. Bring them to the children’s playground, or let them skip through the garden walk. Orchestrate a moment at the clubhouse, the function room, or the dining area. Or if you’d like to go for something more laid-back, you can use the pergola or the barbecue area. The development also has an entrance gate and a guard house, so you can feel at ease. For tenants with vehicles, they can make use of the basement parking area, which accommodates 575, including 7 family lots and 7 handicap-friendly slots. Woodlands is a wonderful environment to live in and raise a family; it’s surrounded by beautiful greenery as well as every modern convenience you will need for a comfortable life. First, let’s behold the lovely outdoors: the area is known for its luxuriously verdant surroundings, so there’s a surely a lot of places for outdoor play, family picnics or nature-walks. You can easily walk to Woodlands Neighborhood Park, Vista Park, or Mandai Tekong Park. For other forms of outdoor recreation, you can check out Woodlands Community Club, Woodlands Stadium, Orchid Country Club, or Woodlands Waterfront. Next, let’s consider the accessibility. A good residential area should be well accessible by car as well as by public transportation. As it happens, roads in Woodlands flow seamlessly toward the Central Expressway and the Seletar Expressway. You can drive effortlessly to the CBD in less than half an hour. In addition, Bellewoods EC is a short walk from Admiralty MRT Station (MRT) and several bus stops. Also within walking range is the site of the upcoming Woodlands South Station. Similarly, every modern community needs to be within the vicinity of some places where residents can buy their basic needs. There’s a Shop N Save beside Admiralty Station, as well as two NTUC Fairprice branches and a Cold Storage in the immediate area. For shopping or recreation, you can go to Woodlands Civic Centre, Vista Point, or Causeway Point. If you don’t mind taking a short drive, Sun Plaza and Sembawang Shopping Centre are 10 minutes away. You can even drive to Orchard Road in less than 30. There are a lot of schools in the area too. Nearest to the site are the Woodlands Ring Primary and Secondary Schools. Other Primary Schools in the area are Quihua, Si Ling, Greenwood and Admiralty Primary. As for secondary schools, there’s Christ Church Secondary School. For junior college there’s Innova JC. If you prefer your kids to learn in an internal environment, you can enlist them in Kingston International School or Singapore American School. The nearest tertiary institutions are Republic Polytechnic and Uptrend College Yishun Campus. Furthermore, suburban living doesn’t necessarily mean being far from all the good workplaces. In fact, Woodlands is one of the areas outside of the CBD which are zoned to have business centers. Within the next several years, residents can look forward to new workplaces and exciting job openings nearby, so they eventually won’t have to go through the daily grind in the metropolis. You can find work that’s much closer to home. Make that choice to build a life that just keeps getting better: buy a beautiful home, where you can live serenely, express yourself, and peacefully raise a family. First off, be sure you fulfill all requirements for owning an EC. Next, find a loan within your means – contact iCompareLoan mortgage broker to compare home loan Singapore. Lastly, make a plan for a brighter future.